5Kevents.org® introduces it’s newest creation of “Pop-Up” Runs. A “pop–up run” is a short-term, temporary event that is “here today, gone tomorrow”. “Pop-Ups Runs” are a 5K run/walk event we plan almost overnight and have very few frills but fun all the same. You’ll still get a timed race, race bib and a finisher’s medal, but usually not more than that, except we will usually congregate for breakfast or drinks afterwards at some welcoming establishment. We will keep these events very simple, low cost and most of all fun! No water stops – So bring water if you want it – before, during and after. No Bananas, no snacks – we’re just going to enjoy the run together and move on with our day! Registration will only be open for a matter of a few days. We will have definite start and end times all designed to bring people together. 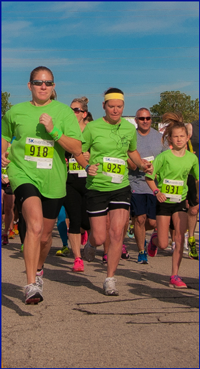 5Kevents.org’s POP-UP 5K™ program is designed to be last minute organized events with little to no frills. You’ll have the option to be timed or not timed. Want a medal? Just say yes or no. T-shirt? Nope, no time for that. Big ‘ol finish line? Nope, we’re going old school. Timing will be traditional, no chips, no timing clock, a shot gun start and if you want an award for finishing first, well… that’s not happening either. We will cover insurance, staff the registration and timing, permit fees for the trails if needed. If you want breakfast or drinks afterwards, we’ll find a venue to cater our group of pop-up runners. How does the POP-UP event work? STEP 1: We will send out an announcement – usually a day or two in advance. STEP 2: Sign up online or at the event – We need WAIVERS Signed! POP-UP races come with no time pressure – your pace is individual to you. Sure we will time your efforts and you can earn a medal for completing but we’re just out here to have fun. You can even walk our races and show up late. But be careful, we’ll be gone 1 hour after the race starts. We’ll post results online. Of course if you finish an hour after the event starts and we’re gone, we’ll just list you as “No Time”. NOPE! We will have a route map for you to see before the race, but no turn signs, no water stops, no traffic cones or course marshals (Pay attention to traffic!). There will not even be a volunteer on the course. We will have a turn around sign next to a blaze orange traffic cone if it is an out and back course – So pay attention. Call UBER. Do you have a GPS? Download our event app (ABS) Athlete Buddy System. It will show you the route on your smart phone and might help you get back to your car. WHAT IF I I NEED TO RELIEVE MYSELF? Yah, that could be a problem. Don’t drink coffee before the run, stop at a gas station, seek out a nice big tree. We will not be ordering port-a-potties, plan in advance! Hopefully there will be one nearby, there usually are a few and we’ll try and put them on our route maps but don’t count on that. I FINISHED LATE – WHERE DID EVERYONE GO? We’ll let you know before hand… we’ll be either eating breakfast or having drinks somewhere nearby. Join us! WHAT ABOUT TIMING & RESULTS? Every Pop-Run will have the same medal – unless we decide to change it… we like change! HOW DO YOU DECIDE TO DO A POP-UP RUN? Mostly because we just like what we do. Usually because a group asks us to or it’s a special day and we want to burn some calories before the big feast like a super bowl game, New Years… that kind of stuff.